Viewing 0 current events matching “gis” by Date. Viewing 168 past events matching “gis” by Date. "Society is being transformed by new maps and new mapping technology. Our mission is to help create a free forum for people to talk about, present, explore, and learn about projects that involve place." WhereCampPDX is a free unconference focusing on all things geographical and cartographical. This informal meeting of minds welcomes all geo-locative enthusiasts, anyone who asks "where am I" or feels the need to "know their place". We share a vision of a fully transparent world where data is geographically relevant and just in time. An unconference is a conference planned by the participants, we all convene together, plan sessions, and have break-outs into sessions. This gives everybody an opportunity to bring to the table the things that interest them the most and lets us talk about new topics that are still new and exploratory. Part of what is important to hearing new voices and getting new ideas is lowering barriers to participation - this event is free and it is driven by the participants. What kinds of people and topics will be discussed? This event is community driven and is what you make it. It provide cross pollination between many different kinds of folks from all walks of life. Topics may include remote sensing, geoinformatics, forestry and agriculture, food chain transparency, civil engineering, emergency disaster relief, urban planning, local search, context awareness, place hacking, social cartography, citizen journalism, locative gaming, psychogeography, locative art, and beyond. Expect to participate in conversations on the nature of place as described in pixels, with rays, on paper, and by social practice! The big event is over, but that doesn't mean the WhereCamp fun has to end. Join us for a casual evening of geo-geekery over beer. The second meeting of the newly re-grouped Portland Open Source GIS user group. Parking is limited, but mass-transit is ample. We'll have some software demonstrations, chat about upcoming conferences, schedule future talks/events and whatever else we can think up. We'll adjourn to a local boozery around 8 for more co-conspiring. You can find out more and sign up for announcements by joining the google group http://groups.google.com/group/pdx-osgis. The [not] first meeting of the newly re-grouped Portland Open Source GIS user group. We'll have some type of software demonstration, discussion about group structure and preferences, and then adjourn to a local boozery around 8 for more co-conspiring. You can find out more and sign up for announcements by joining the google group pdx-osgis. The next meeting of the OpenSpatialPDX will be happening June 24 at OpenSourcery! Update on state initiative put forward by Dean Anderson from Polk County to replace various desktop and web-based tools with OS solution. We're going to have our first WhereCamp PDX planning meeting next week, July 2nd, 7pm at Produce Row (out on the patio). This is just a general brainstorming meeting to start things off, so bring your ideas. The evening will start with a potluck to which neighborhood groups are especially invited. Then Jeremy O'Leary will be showing how the 20 minute walkable neighborhood model works well with a variety of emergency response scenarios. The presentation will be based on the term project for his recently completed GIS graduate certificate. Postponed due to heat wave. We'll meet next week, same time, same place. Planning meeting for WhereCamp PDX, which will take place in September. Help us create this year's event. Help us plan this year's WhereCamp PDX. Come help us plan this year's WhereCamp PDX! Planning meetings occur weekly leading up to the event in late-September/early-October. WhereCampPDX is a free unconference focusing on all things geographical. This informal meeting of minds welcomes all geo-locative enthusiasts, anyone who asks "where am I" or feels the need to "know their place". We need help with all aspects of planning the event, from recruiting attendees, to finding sponsors, to ordering food and other on-site needs. This is a great time to step in and see how you can help. Monthly meeting of the Portland area open source geospatial user group. Women In GIS (WIGIS) is a network of people sharing ideas, experiences, and resources to promote geographic inquiry and support women working in GIS and related fields. WIGIS is a Special Interest Group of the Oregon and Southwest Washington Chapter of URISA. Several WIGIS members (including a local social media guru) have been brainstorming about new directions for WIGIS that include expanding our network, opening channels of information, and more actively encouraging participation from all members. We're thinking Twitter, Facebook, a wiki page perhaps. We invite you to join us for Happy Hour on September 30, where we hope to continue discussions in this vein. Please come if you want to bounce around ideas, learn more about social media, or just get to know other local folks who share an interest in GIS. All are welcome. Help us plan this year's WhereCamp PDX, it's starting this Friday! We're looking for volunteers and suggestions. IMPORTANT: Please RSVP for the Opening Party so we can plan accordingly. We're kicking off the weekend with an opening party at Gallery Homeland to mingle with other geo geeks discuss session ideas for Saturday's unconference. VENUE: The entrance to the party will at the corner of 11th & SE Division, look for the signs. IMPORTANT: Please add yourself as an attendee for the unconference so we can plan accordingly. WhereCampPDX is a free unconference focusing on all things geographical. This informal meeting of minds welcomes all geo-locative enthusiasts, anyone who asks “where am I” or feels the need to “know their place”. An unconference is a conference planned by the participants, we all convene together, plan sessions, and have break-outs into sessions. This gives everybody an opportunity to bring to the table the things that interest them the most and lets us talk about new topics that are still new and exploratory. Part of what is important to hearing new voices and getting new ideas is lowering barriers to participation – this event is free and it is driven by the participants. IMPORTANT: You must RSVP and pay for the Saturday dinner if you want to eat, but you're welcomed to hack with us even if you don't buy dinner. Bring your laptop and a project to work on if you have one, or come and see what other people are doing. Hint: Friday and Saturday both have ample opportunities to scout out hacking ideas. WhereCamp is a free, open unconference for all geo-technology enthusiasts. The game day is a chance to get out around town, and try out different locative and urban games and activities. Last year we did Pac-Manhattan, Cruel 2B Kind, and a disaster preparedness mapping activity. Check our website for details on this year's game schedule. We will base at Backspace, and games will issue forth from there. NPOs and NGOs are using modern mapping technologies for a variety of purposes and projects from tracking endangered species to visualizing inter-agency response to an earthquake in Indonesia. Join PDXTech4Good at a special workshop with mapping expert Jim Craner and Humaninet. At this workshop, we'll take a deeper dive into mapping strategy and how you can integrate mapping and help use GIS technology to further your mission and cause. This will be divided into 2 groups: Beginner and Intermediate. More details to come but please RSVP if you're interested in getting those details. ......................................................................................................................... And after the workshop, kick off 2010 with PDXTech4Good, a cold beer, and more maps! PDXTech4Good will feature a "showcase" of nonprofit and community projects that use online mapping and GIS (geographic information systems). We'll hear how organizations are using maps and GIS to gather information from their community, improve service and program delivery and effectiveness, and tell stories about themselves and their community members. Start 2010 off with PDXTech4Good, a good map, and a cold beer! NPOs and NGOs are using modern mapping technologies for a variety of purposes and projects from tracking endangered species to visualizing inter-agency response to an earthquake in Indonesia. PDXTech4Good will feature a "showcase" of nonprofit and community projects that use online mapping and GIS (geographic information systems). We'll hear how organizations are using maps and GIS to gather information from their community, improve service and program delivery and effectiveness, and tell stories about themselves and their community members. ......................................................................................................................... And prior to the meeting, we'll have a special workshop with mapping expert Jim Craner and Humaninet. Help us plan this weekend's CrisisCampPDX. Bring your lunch to NedSpace and look for the "CrisisCampPDX" sign inside. You don't need to be there the entire time, come to as much of it as you can. You can get take-out lunch at nearby restaurants, like in Chinatown or the foodcarts at 10th and SW Alder. Monthly gathering of the Portland Open Source GIS user group. All are welcome to learn and share. This month we're discussing the upcoming GIS in Action conference that has moved to a new venue at Portland State University. There are opportunities to present there. Tentatively, there will be an introduction to GeoDjango along with some application demos. We'll then adjourn to a local boozery around 8 for more co-conspiring. Meet and talk with real life land managers at the Green Dragon this Thursday to discuss how augmented reality can aid their field work. Green Dragon is kid friendly in the bistro section after 4pm. So much beer too. This meetup is intended to bring folks up to speed on what has been done for the OpenStreetMap mapping effort for CrisisCampPDX and other cities. We'll also have plenty of time to cover other OSM topics and future events. Meeting agenda: - upcoming GIS conference planning update - finally ESRI geodatabase support with OGR, if you have an ESRI license :( - CitizenReports, who's the new kid on the block. someone demo this open source or not! - What's the word on the street folks, let's hear some geo gossip from around town. - Tim can pull out an app to do some show and tell with. Meeting agenda: - upcoming GIS In Action conference. map smackdown volunteers needed. (20 mins) - upcoming OS Bridge conference, free pass, talk submissions (15 mins) - Tim can demo the new MarineMap tool (Google Earth based web application). (20 mins) - short 5 minute demos of something you've been working on or learned about. Could be like a forum if you're seeking information. [Day two of] Hosted by the Portland Open Source GIS Users Group, this "unconference" will follow a 2-day traditional GIS conference, GIS In Action(GIA), which will also include some open source tracks--mostly concentrated on Thursday. Please register in advance at the website! Meeting agenda: - Meeting is canceled due to following so closely on the heels of our GIS unconference at Portland State Uni. Come help plan this year's WhereCampPDX, an unconference for geographic technology! Show up early or stay late to chat with your fellow geo-geeks. The planning meeting will start at 7pm and run until we're out of business to discuss (last week it only took half an hour). Come help plan this year's WhereCampPDX, an unconference for geography and technology! Show up early or stay late to chat with your fellow geo-geeks. The planning meeting will start at 7pm and run until we're out of business to discuss. This all day event is free to the public. It is co-sponsored by the PDX-Open Source GIS users group, a special interest group of OR-URISA. This event is coordinated with WhereCampPDX, and attendees are encouraged to attend both events! Attendees should plan on bringing a laptop to participate in the hands-on portion and a three-hour walk-thru of selected open source GIS applications. Agenda: * 9am - 11am : OpenStreetMap - Presented by Cloudmade * 11am - Noon : The Open Source GIS stack - Presented by PDX-OSGIS * Noon - 1pm: Lunch on your own * 1pm -3pm : The Open Source GIS stack * 3pm - 5pm : Invited demos of projects solved with open source gis tools. This event takes place at Portland State University, in the Smith Center's VanPort Room (#338). Registration is free but space is limited to 72 participants. Please feel free to post any questions to the PDX-OSGIS user group! Ben will share some recent work he did using R for spatial data visualization. He will discuss how to read shapefiles and rasters into R, how to join and process data related to those shapes, and how to generate dynamic animated map products. Do you have a problem that you are trying to solve with R that you just can't get to work? A model you can't seem to specify? A graph you can't tweak? A dataset you can't tame? An interface you can't bridge? A bug you can't trap? Well, try some group theRapy. Bring your laptop, problem, and/or dataset and we will try to tackle the problems you are having as a group. If there are multiple problems, we can break into smaller groups. Don't have any current unresolved problems of your own? Then maybe you can help someone else, or at least learn from their problems before they are yours. Ben Stabler is a Supervising Modeler at Parsons Brinckerhoff. Parsons Brinckerhoff "provides strategic consulting, planning, engineering, and program and construction management services to both public and private sector clients ... in multiple market sectors, including transportation, power, buildings/facilities, water/wastewater, environmental, and urban/community development." Hey everyone, The January gathering of the open source GIS group is on for 6:30-8pm at Open Sourcery on Jan. 26. Hope you all had a great holiday. The meeting is byob but we usually wander to a nearby watering hole afterwards. MapBox - creating custom maps in the cloud. Sara is bringing someone involved with its development to show some things off. I've been interested in their mb-tiles standard and tools for supporting offline maps for a while. FOSS4G 2011 in Denver. Sep 12-16. You're going right? Call for presentations opens in Feb! While there are many CrisisCamps around the globe for the Japanese relief effort, we will be having a small strategy session this Saturday to plan for a larger CrisisCamp track at the PDXOSGIS Unconference and Hackathon at the end of March. Some things we'll need to discuss are data sources, taxonomy (OSM presets for humanitarian relief), and coordination. There will be some editing so bring a laptop and be familiar with OSM (plenty of videos). We meet the 4th Wednesday of every month from 6:30-8:00 PM at OpenSourcery in NW Portland. No need to RSVP, all are welcome- our group ranges from the geo-curious to the überhackers. [Please arrive no more than 10 minutes early, as the developers at OpenSourcery are working up until the meeting time.] If our meetings are canceled or changed we will post this in Discussions, so please check there for the most recent information and activity. This week: covering number of topics related to the PDX OSGEO Unconference next week. This is a free Open Source Geospatial Unconference put on by the Portland OSGeo User Group. The unconference takes place the day after the GIS in Action conference and is registration is free (though we request you sign up for a ticket here to assist us in planning). The unconference will begin with registration at 9:00am and end at 5:00pm. Coffee, tea, and water will be provided, however participants are on their own for lunch (there are numerous dining options within close proximity). The unconference will take place in PSU's Smith Memorial Student Union building, on the third floor, in rooms 327, 328, 329, 333, and 338. Registration in room 338 (the VanPort room). Maps of PSU Smith Memorial Student Union are available here. This is a participant-driven event! If you've never been to an unconference before (Portland's WhereCamp is an excellent example), the format and sessions are determined on the day of the unconference by the people attending. No idea is too big or too small. A hackathon is planned for Friday so check the wiki as plans materialize for this. Please feel free to contact the PDX OS GIS User Group (Google group) with any questions. A continuation of the Open Source GIS Unconference on Tuesday. GIS developers can come and do some coding or write documentation for whatever projects they dream up. Meanwhile, we will also be hosting a Crisis Camp where anyone can come and help update a map of Japan in the wake of the Sendai disaster. We will provide training to anyone who is new to Open Street Map editing. Just another spontaneous geonerd pub crawl. We'll start from Baileys and crawl from there. Follow us on Geoloqi for locations. We meet the 4th Wednesday of every month from 6:00-7:30 PM at OpenSourcery in NW Portland. No need to RSVP, all are welcome- our group ranges from the geo-curious to the überhackers. [Please arrive no more than 10 minutes early, as the developers at OpenSourcery are working up until the meeting time.] If our meetings are canceled or changed we will post this in Discussions, so please check there for the most recent information and activity. Beer at nearby pub to follow. After the unconference sessions, join us for pizza and hacking on geo-technology projects. We meet the 4th Wednesday of every month from at OpenSourcery in NW Portland. No need to RSVP, all are welcome- our group ranges from the geo-curious to the überhackers. [Please arrive no more than 10 minutes early, as the developers at OpenSourcery are working up until the meeting time.] If our meetings are canceled or changed we will post this in Discussions, so please check there for the most recent information and activity. This week: Lev Tyspin from ThinkShout (http://thinkshout.com/) is coming to talk about some Drupal mapping work they've done. We meet the 4th Wednesday of every month at the Collective Agency in NW Portland (Old Town). No need to RSVP, all are welcome - our group ranges from the geo-curious to the überhackers. This week: Share-one-thing. It's been a long hiatus so no official agenda. Just bring something you've been working on or ideas you would like to share. Beer at nearby pub to follow, probably Pints. Gift for OpenSourcery. If you were able to enjoy our old meeting space with them consider bringing a contribution of $5 or more. GIS in Action conference talk proposals. Give your talk or let's brainstorm for them. Do we want to do an unconference day? We meet the 4th Wednesday of every month at the Collective Agency in NW Portland (Old Town). No need to RSVP, all are welcome - our group ranges from the geo-curious to the überhackers. Beer at nearby pub to follow, probably Pints. Google Maps has long been the choice for embedding maps on your website, or building map mashups. But Google's recent announcement that they will start charging for maps (or including ads on maps) has people looking at other options. As an added bonus, many of the alternative solutions have significant advantages over Google Maps. If you are a website owner with an embedded simple map, this talk will show you how you can dump Google Maps and switch over to other solutions in minutes (both free and paid). If you are a web designer, you'll see how you can customize maps so they will look the way you want them to look, not the way Google wants them to look. If you are a programmer building map-based webapps, you'll see how open source mapping APIs like Leaflet and Modest Maps make it faster and easier to build map mashups and have them work the way you want. 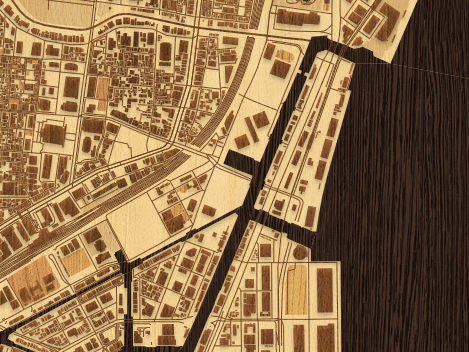 MapBox - Justin Miller - @incanus77. Justin is all things iOS for the MapBox team. He'll be joining us again to show us what MapBox has been up to lately (and they've been busy) including their strategy in the Google Maps space, their new iOS SDK, MapBox streets layer, custom styled maps, what Artem from Mapnik is doing now that he's joined the team and what they're doing with open source in general. Something for everyone and a great follow-up to Wm's talk. Bio - Justin brings a wealth of mobile application development experience to MapBox. He has expertise in client-side programming on the Mac, iPhone, and iPad, as well as server-side programming and administration on UNIX platforms. this month we don't have a talk lined up so we thought we would shake things up a little bit and do a little hack session as a group with one of the newer kids on the block, CartoDB. It's data management, map styling/publishing and an API for vector/raster spatial queries all rolled into one without needing to muck with server management. A researchers dream and built on open source goodness. What's that you say you're not a software developer? Perfect because you don't need to be to get started. We can roll up our sleeves and work together, ask lots of silly questions and learn lots of new things. They offer a free account and tutorial to get started. Should be fun, see you tomorrow. Distributed version control systems have quickly become the dominant means of code collaboration in the open source community. Darrell Fuhriman will be giving a quick overview on version control, specifically git and give examples of how projects use git and github to manage their code. Want a head start? Check out git-scm.com for some great reference guides and tutorials. Updates on WhereCamp, NACIS, and other geoconferences, and regular OSGeo business to follow. We meet the 3rd Wednesday of every month at several locations usually in NW Portland (Old Town). No need to RSVP, all are welcome - our group ranges from the geo-curious to the überhackers. Beer at nearby pub to follow, probably Pints. This month is casual fun in the sun and we'll see where it goes. OSCON attendees are welcome to join us and tell tales of mapping adventures. If it's too sunny up on the terrace we can grab tables down on the back patio. Should be fun, see you tomorrow. We meet the 3rd Wednesday of every month at several locations. No need to RSVP, all are welcome - our group ranges from the geo-curious to the überhackers. Beer at nearby pub to follow. Eli L Adam will present a short desktop demo. It features fun stuff with GPS, Geotagged photos, and QGIS. Ogr2ogr, GPSBabel, and GpsPrune also can play an optional minor role. Join us in planning this year's WhereCampPDX, happening October 12th-14th. WhereCampPDX is an annual unconference for all things related to geography, cartography, and how we interact with the world. Past topics have include strange maps, open source GIS tools, and geo-locative games. We need your help to make this event happen! Please join us Wednesday to find out about volunteering, sponsoring, or otherwise participating in making this year's WhereCampPDX awesome. This week we're meeting at the Lotus Room to check out the banquet room space as possible overflow for next week's kick-off party. Join us for the Fifth Annual WhereCampPDX Kickoff Party this Friday at Geoloqi HQ. Beers and banter will be provided. With the growing numbers of geonerds this weekend, we're hoping to acquire more space just downstairs at either Lotus Room or Nedspace. Watch this space for details. WhereCampPDX is a free, volunteer-created unconference for anyone interested in geography and technology. This year’s event will be happening October 12th-14th, with a full day of unconference sessions at Metro Regional Center on the 13th. An unconference is a conference planned by the participants. We convene together, plan sessions, and break-out into the proposed session discussions and activities. This gives everyone an opportunity to bring to the table the things that interest them the most, and talk about emerging topics that are still new and exploratory. We value open participation, providing access to new voices, and lowering barriers to participation. As a result, the event is driven by the interests and talents of the participants. To attend, you'll need to be signed up at http://wherecamppdx5.eventbrite.com/ by the party time! If you arrive after 6pm, call 503-577-4247 and someone will let you in. Please try to arrive before 6pm! Come join us for the second #editathon event of 2013, a weekend of mapping on April 20-21. All over the United States, we will be improving OpenStreetMap starting at 12 noon Eastern going until 6PM Pacific. In Portland, we'll meet at noon on April 20th. At 1:00pm, we'll have a brief presentation introducing OpenStreetMap and the tools for editing it. Then we'll start editing, either on your own or on one of our to-be-determined targets. In coordination with the Oregon and Southwest Washington URISA GIS in Action conference, we will be hosting an Esri Dev Meet Up on Wednesday, May 1st. Food and beverages will be provided at the meet up. Theresa Valentine from the USDA Forest Service "GeoNIS: Automating the Process of Integrating Spatial Data for 26 Long Term Ecological Research (LTER) sites, and Making Data Available via Map and Image Services"
Paul Ferro is a GIS Analyst for DOGAMI. He will be presenting "Tips, Tricks, and Scripts for Planning Your Migration to ArcGIS Server 10.1." It will cover how to mine and archive 10 Web service properties for a 10.1 deployment and use Python to stage 10.1 service definitions in advance. Dana Maher is a Mobile Application Developer who works on Web and mobile applications, primarily relating to Emergency Management, Urban Planning, and Operational Support will present "Architecting a Mobile Common Operating Picture for Emergency Management." She will cover the architecture of an app that pulls from a disparate group of spatial data sources and formats to provide a common operating picture for Oregon emergency management. *8:30 - 9:30 PM Raffle, Networking and Social. The Hack-a-thon will be discussed. Open discussion: Recap of the GIA conference + unconference, open topics. If you arrive after 6pm, please buzz the security guard, who will open the doors and let you up to the 9th floor. The office is through the double doors immediately to the left after exiting the elevators. Monthly meeting of the Portland open source GIS group. Projects big and small are usually presented monthly along with rousing conversation and discussion. All are welcome, no need to RSVP - our group ranges from the geo-curious to the überhackers so bring your ideas and questions! FYI, we won the bid to host FOSS4G in Portland in 2014 so expect an update and much patting on the back! Expect lots of opportunity to volunteer and make this conference a great one! Join the ORURISA Young Professionals for a casual happy hour at Rontoms. Get your map talk on, have a beer, and enjoy the last night before WhereCampPDX! The ORURISA Young Professionals are a special interest group of the Oregon chapter of URISA, a professional organization for those in the GIS and geospatial fields. We are dedicated to providing skill building and career development opportunities for GIS and geography students, low-level employees, and anyone who wants to learn something new! If you're unfamiliar with our organization and you're involved in location/spatial/geography/GIS/mapping projects in Oregon or SW Washington, check us out! We'll be outside if it's nice out and inside if it's raining. We'll have a globe on the table, so keep an eye out for that. See you there! Come meet fellow geo enthusiasts and get excited for Saturday's unconference sessions at WhereCamp! Portland's favorite annual geography unconference is back again! Stay tuned for more details. Hey map nerds, geo geeks, and the spatially curious: MaptimePDX is having a November meetup, and we want you to come hack with us! MaptimePDX is a monthly/bi-weekly hack and learn event for the geographically inclined. November's event will be a hack night! Come out and work on your map project, or work on one of the exercises we will have for you to do. If you're brand new to maps and code, we will also have a group of people working on building their first web maps, with lots of people there to help! Beginners are very welcome and encouraged to attend! Please bring a laptop if you can. If you're at all interested in casual mentoring at the event (a.k.a. answering questions or sharing what you do), please shoot us a message on Twitter. We all use maps every day. Let's learn how to make them even better... together. Welcome to MaptimePDX, a monthly hack and learn meetup for map nerds, geo-geeks, and the spatially inclined. Beginners are very welcome! Our goal is to be inclusive no matter your tech level, so bring your questions, geoprojects, and mapping curiosities. If you want to get hands-on, we'd also encourage bringing a laptop. If you have any questions about the group or have something you'd like to show/teach send us a message on Twitter @MaptimePDX. Last minute plug for a geo breakfast. Come hangout, drink coffee, and eat yummy K&Z grub with other geonerds. Just look for the mappy people. Tonight at MaptimeStJohns, we will review some compiled leaflet maps using several of the leaflet pluggins. We will go through some live custom examples using humangeo's dvf pluggin, we will use postgis and output geojson, geocsv and topojson to add to our leaflet maps, and also discuss some temporal mapping tools. Bring your laptop with leaflet installed and a webserver available. Have a server scripting language such as php or python and postgressql/postgis installed. If you don't have a laptop, come anyway and you will be able to see these tools in action, as well as receive any materials handed out at the meetup. Bring a flash drive so you can take a copy of the data home. LET'S GET TOGETHER AND MAP AT MAPTIMESTJOHNS! We are meeting at Urban Airship this time while Esri gets settled in to their NEW office building (congrats!). We have a couple quick demos and pres-itos lined up so bring your ideas, projects, and apps to share or hack on. May 7, 2014 Esri R&D Center Brand New Office Party! Come Celebrate our new Office! After Portland startup Geoloqi joined Esri in 2012, our office has grown from 6 to 20 people and our current space didn't fit everyone! This year, we found an awesome new space downtown and moved into a new, permanent location. Now that we're all settled into our new space, we'd love to invite you to join us in celebrating growth, community and all things geo! We'll have Legos, toys, and even a custom-built Settler's of Catan board for you to play! Feel free to bring other board games if you'd like. RSVP on EventBrite so we can make sure we have enough drinks and light snacks (gluten free) for everyone! We are using Eventbrite to track RSVPs, if you know you are coming please reserve a ticket! In addition to celebrating Esri R&D Center Portland's new office, we will be celebrating Geoloqi's 4th year anniversary, as well as both Amber Case's and Patrick Arlt's birthday! The entire Portland tech community is invited, as well as friends and family of the Esri R&D Center team! We have all of you to thank for helping us get where we are today. Special thanks to TiE, PIE, PSF, PDC for funding us, providing mentorship and being patient with our crazy vision this entire time. It's been 4 years since Geoloqi started, and almost 2 since we've been a part of Esri! In town for Write the Docs, Monitorama or Webvisions? Feel free to join us as well! It's time for the May Maptime! Mayptime! Note that we're meeting at the NEW Esri R&D Center office off SW 6th Ave this time around. Our goal is to be inclusive no matter your tech level, so bring your questions, geoprojects, and mapping curiosities. We also highly encourage bringing a laptop so you can get hands-on! Developers and geo enthusiasts are invited to discuss geospatial technology and development, learn from each other, and socialize on us (Esri). At GeoDev Meetups, you can demonstrate your application/framework, present an interesting concept or idea, share your experiences, and connect with other developers. Tillmill 101 - writing CartoCSS, mustache templating, using your own data, and previews of TM2, the next iteration of TileMill. Matt & Tim are going to talk about some things, but mostly we're gonna have us some geobeers and be geo-awesome. This month at MaptimeStJohns, we will begin programming a basic web spatio-temporal visualization, bring a computer if you have one. Ill bring the js library files for leaflet and the various plugins we will be using. If you have a temporal dataset, bring it... Ill have a couple of datasets to choose from though. Our goal will be for everyone to create at least one temporal point visualizations. An example would be the point locations of where floods occurred with the location, size of flood and date of flood event. With this data we could create a temporal proportional symbol map. The user will be able to click on the locations for specific locations and also use a slider to see when and where floods occurred over time. Let's create some cool web map visualizations! We have a little project for the FOSS4G 2014 website to hack on! They want to map out some entertainment options (restaurants, bars, other POIs) for a Portland guide and are looking for some assistance. Some of the Esri PDX folks may do some presentation practice runs in preparation for the Esri UC as well. Show and Tell - Show us your cool maps and mapping apps! Portland's favorite annual geography unconference is back again! WhereCamps are unconferences that aim to connect geo-enthusiasts, developers, social place hackers, artists, activists, grad students, geographers, earth scientists and anybody else who wants to "know their place". Popular topics include social cartography, software and hardware, context awareness, mobile experimentation, humanitarian mapping efforts, food webs and local food transparency, transit, psychogeography, geo games, paper maps, and place hacking. This year's WhereCampPDX is being held in conjunction with FOSS4G, the largest global gathering focused on open source geospatial software. Monthly meeting of the open source GIS group PDX-OSGeo. Discussion of all things spatial and open source. MaptimeHQ has been migrated to a new website! Urban Airship graciously opens its doors this Saturday for a half day #OSM Portland building import hackathon. Come write docs, work on conflation scripts, and help do some testing. All skill levels and background welcome. Featuring abundant free refreshments, a keynote speech by Erin Aigner of Second Story (formerly of The New York Times), geo-trivia with awesome prizes (the Society for Conservation GIS donated 10 GIS books! ), and an optional round of speed networking. Made possible by the generous support of PCC, PDX-OSGeo, the OR-URISA Young Professionals, the PSU ASPRS Student Chapter, DOGAMI, the Society for Conservation GIS, and Esri PDX. Programming OS Web Spatio-temporal Mapping Visiualizations: Tues, Dec 30, 7:00pm, Anna Bananas St Johns, 8716 N. Lombard, Portland, Oregon (back room). This month we will work with OpenStreetMap Data. We will use JOSM to edit OSM data and learn to download OSM data for use in our web visualizations. Discussion of all things spatial and open source. Tonight's guest is Dave Mangold, who will speak to us about how to create great cartographic products using QGIS and Inkscape. Attendees of FOSS4G will remember the excellent map that Dave produced for the printed program . This map was created entirely from freely available data and open-source software. Data were obtained as shapefile downloads from METRO RLIS. These shapefiles were then loaded into a PostGIS database as spatial tables. The initial map was created in QGIS. This map was then saved in a vector format and finished in InkScape, where label adjustment and creation, feature layering, and annotation were accomplished. On the map, if you look closely at the southern portion of Naito Street (right edge of left panel), you will see a hidden tribute to the free and open-source resources used. We recommend you install a text editor with syntax highlighting. Sublime Text and Notepad++ are two popular choices (of many). Discussion of all things spatial and open source. Tonight's guest is Nick Martinelli who will speak to us about using CartoCSS and UTFGrids for collaborative mapping. Warning, this talk is about cartographers designing and building web applications. Tasked with making a mapping application for internal business use, we reached out for open source tools that could be combined to produce a platform for collaborative mapping and data sharing. We used tools like Mapbox.js, windshaft, mapnik, and PostGIS to build a web based application that allows its users to create, filter, edit, and share interactive maps and data with teams or individuals. The presentation will take you through the challenges of building on FOSS, and the importance of small group collaborative mapping. Highlights will be our efforts to use great, but occasionally sparsely documented FOSS code and tools, and the sometimes challenging chore of making them play nice together. Also, discussion of why we feel collaborative editing and creation of dynamic maps is an important future focus for web mapping applications. Last, the product we ended up with, and continue to develop for private use opens up the conversation about how to best give back to the FOSS community from the private sector. Discussion of all things spatial and open source. Tonight's guest is Katie Urey who will speak to us about SpiderOSM. Street conflation is a long time difficult problem and this is a project that looks very useful. The project gives Portland lots of attention as well. SpiderOSM is an open source python package for matching segments in one path network, e.g., streets and trails, to corresponding segments in another, based on geography and network connectivity. This allows joining together attribute data from separate sources. Importantly authoritative jurisdictional data can be correlated with the rich, crowd-sourced, user editable and extensible, Open Street Maps data. Multifactor match scoring, allows data to be joined only for high confidence matches. The initial version of the matcher was coded in early 2014 specifically to combine Open Street Map data with Portland Oregon area jurisdictional data (RLIS) to facilitate pedestrian infrastructure analysis and planning. Since then the code has been refactored into a generally useful python package that installs, via pip, and works on all three major platforms: Mac OSX, Linux and Windows. The code is stable and mature, with version 1.0 just around the corner. The Portland Area Mismatched Name Survery (looking at name mismatches between OSM and RLIS identified by SpiderOSM.) Some folks at TriMet and others at PDOT have begun this project, but there is ALOT to be done! A QGIS Plug-in for spiderOSM. Ryan Peterson has recently begun this project, and would welcome help. Another opportunity, not yet begun: looking for someone interested in developing an ESRI Plug-in for spiderOSM. Calling all mappers! There will be a group at the Esri Portland office this Friday evening helping with the Humanitarian OSM mapping efforts for the Nepal earthquake crisis. Prior experience mapping, particularly in OpenStreetMap, is highly recommended and you will need your own laptop. Beginners are welcome to come, but we may have you run through some tutorials to get up to speed rather than work on the Nepal data. Thank you Esri Portland for providing space! This month's topic is Cartographic Design Principles. Programming OS Web Spatio-temporal Mapping Visiualizations: Tues, May 27, 7:00pm, Anna Bananas St Johns, 8716 N. Lombard, Portland, Oregon (back room). This month we will continue to work with OpenStreetMap data, editing in JOSM and downloading data to qgis and making a desktop map. We will then begin the process adding the data to a web visualization. • Meet cool people. Duh, we're there. • Show us what you got by demo'ing your application or framework. • Make a name for yourself in presenting an cool new/interesting concept or idea. • Impress someone by sharing your experiences. • Make BFFs for life - connect with other developers! This month's agenda: we'll be recapping summer events such as the State of the Map, happenings in Bonn, and the recent Symposium by the Sea. Did you do any cool geo-projects over the summer that you want to share? Bring them along! Paidtogo is an app and web based platform that empowers governments, businesses and other organizations to incentivize commuters to take alternative forms of transportation. With this platform we can track, verify and pay commuters by the mile to walk, bike, take public transportation and carpool. As always, there will be pizza. Bring your own geo-topics are welcome, as are bring your own geo-beverages. This month's agenda: exciting happenings in geodata, Special guest Max Ogden will be on hand to tell us all about Data Refuge, Data silos, and project Svalbard. Read more about that work in the New York Times  and bring your own geo-show and tell. Plus schedule updates for summer events: FOSS4G, State of the Map US, and more! This month's agenda: exciting happenings in geodata, Special guest Arty Rodriguez (ODFW Oregon Conservation Strategy GIS Analyst) and Ryan Hodges (Ecotrust Senior Software Developer who will be talking to us about the Compass mapping application and the http://OregonConservationStrategy.org website developed for Oregon Fish and Wildlife. More from Arty and Ryan is included below. In addition, bring your own geo-show and tell, and come ready to hear about schedule updates for summer events: Pedalpalooza, FOSS4G, State of the Map US, and more! Come learn how to find public data sets and collect spatial data in and with your community! In the first half of the class, you will learn how to use Google Earth Pro, a free data mapping tool, as well as a few basic functions using the data analysis tool QGIS. We will also touch on methods and ethics in community data collection and display. The second half of the class will be a workshop for your ideas, so please come to class prepared with a community project idea which you are working on, or would like to work on using mapping tools. Goal of class: By the end of this class, students will be able to: -create map surveys, create map objects (points, lines, polygons) on Suprmap.org -visualize and add detail to inputs in Google Earth Pro -add data layers to a map, perform spatial join, and modify data table in QGIS -They will know where to find public data sets, and how to make their own -They will also be briefed on community data collection practices, and honest and ethical data collection and distribution. -In workshop, we will provide some ideas on what data sets and data analysis tools would help them work on their project. This month's agenda: exciting happenings in geodata, a recap of summer events and FOSS4G highlights. Special guest Ricardo Morin will talk about "Highlighting Oregon’s WildLands" (HOWL), a recap of his presentation in Boston. More information at Ricardo's blog here: http://blog.rikitraki.com/FOSS4G-update/ and in the full abstract below . In addition, bring your own geo-show and tell, and come ready to share info on any fall geo-happenings that are on the horizon! The HOWL (Highlighting Oregon's WildLands) project aims to create an interactive 3D/4D mapping and visualization tool for presenting spatio-temporal information relevant to the preservation of wilderness and wildlife protection in Oregon. HOWL will be available to conservation advocates (e.g., Oregon Wild) and the general public, to improve dissemination, understanding and interpretation of multiple publicly available data sources. Candidate data sets include boundaries of current and proposed wilderness areas, wild and scenic river areas, national forests and other public lands, wildfire events, wildlife migrations, deforestation history, and satellite imagery, to name a few. HOWL is a web application being built using CesiumJS, a powerful open source 3D mapping and visualization library, which enables incorporating not only realistic terrain modeling, but also volumetric symbols to build interactive 3D thematic maps. In addition, HOWL will leverage the temporal visualization capabilities of CesiumJS to add the 4th dimension, thus enabling dynamic playback of related past and/or predicted events. Visualizations examples include wildfire history in old growth forest areas, wildlife migration records, and deforestation chronicles. This presentation dives into details of building HOWL by leveraging open source front-end components (e.g., CesiumJS, jQuery, Bootstrap), back-end tools (e.g., MapShaper, toGeoJson, TopoJSON, node.js) and workflows for data acquisition, transformation, and integration. The presentation addresses key design decisions, technical challenges and future developments. DAMA welcomes Sarah Battersby, Senior Research Scientist at Tableau Software to Portland on Thursday, September 21st. She will be presenting "Cartograpghic Licence and Building Maps That Work". Also Included: Continental Breakfast and Networking with other Data Professionals! This month's agenda: exciting happenings in geodata, upcoming geoevents. Special guest Emmor Nile will talk about "Using OpenStreetMap in a cross cultural context; experiences of working with OSM Africa". Emmor lived in Ethiopia for 10 months in 2016/17 and volunteered in a variety of OSM projects while there. Hoonah Stewards: https://www.hoonahstewards.net/ a land and resource management tool where tribes can record their activities and landowners can manage in ways that have lessened negative impact on tribal use. Traditional Ethnographic Knowledge Database (TEKDB): http://tdntek.ecotrust.org/ a database exploring and revealing the connection between cultural and natural resources. In addition, bring your own geo-show and tell, and come ready to share info on any upcoming geo-happenings that are on the horizon! This month's agenda: exciting happenings in geodata, upcoming geoevents and bring your own geo-show and tell. We'll be plotting geospeakers and topics for 2018, so bring your nominations and ideas! This month's agenda: exciting happenings in geodata, upcoming geoevents and bring your own geo-show and tell. As always, there will be pizza! And BYOB is always welcome. Qgis2Web is a plugin for QGIS, desktop GIS software, that converts map data into a Leaflet app running in the browser. This demo will show how to create a simple online map with multiple raster layers and one vector layer that has image popups.This particular application is unusual in that it is a thin-section of rock approximately 24x46 mm with embedded electron microscopy images. Percy is PSU Geology department's GIS Geek for the last 20 years, and helped form PDX-OSGeo way back in 2006, so come on out and enjoy some pizza, learn about QGIS, and get your monthly OSGeo fix. This month our special topic is "Tools for telling stories with Data and Maps". We'll cover a wide range of tools for making charts, tours, interactive graphics, timelines, (and of course maps! ), and methods and tools for wrapping all these items up into stories built for the web. It'll be a whirlwind tour and cover options from tons of different free and open sources, so if this if this is your sort of thing, don't miss it! This month our special guest is Nicholas Chun, manager of the Oregon Population Forecast Program (OPFP). The OPFP produces regularly updated, coordinated population forecasts for Oregon counties and cities to assist them with their long term land use planning strategies. In addition to his primary role, Nick regularly create demographic profiles for customized areas using census data. Most of his data extraction and manipulation is done in R studio because of its flexibility and diverse number of packages. Among other things, Nick will be demonstrating how to use R to grab census data from the official APIs and produce basic choropleth maps. Bring your questions and come prepared to learn! The Esri GeoDev Meetup is back again, but this time we're trying something new! We have listened to your feedback and we are introducing themed meetups! Join us on Wednesday, September 26th for a Python-themed meetup. That means the intro, keynote, and lighting talks will all be focused on usages of Python within the context of GIS. Food and beverages will be provided at the meetup. Have you built a cool Python app recently that you'd like to show off? Submit a lightning talk! We'd love to see it! This month's agenda: Special guest Rafa Gutierrez will be coming by to tell us all about a bunch of new tools out from Mapbox, such as Unity and Vision SDKs, updates to GL JS, and Studio. Rumor is our special guest may even bring a special guest! We'll also cover the usual exciting happenings in geodata, upcoming geoevents and bring your own geo-show and tell. This event is a social gathering for developers to discuss the latest in mapping, geo technology, geo services, web and mobile mapping apps, app design, cloud solutions, map data or anything else related to solving real-world "geo" problems. Developers of all levels of expertise are welcome, from seasoned GIS professionals to those new to geospatial development. Join us on Wednesday, December 5th for a Mobile-themed meetup. That means the intro, keynote, and lighting talks will all be focused on usages of mobile within the context of GIS. Food and beverages will be provided at the meetup. Have you built a cool geospatial mobile app recently that you'd like to show off? Submit a lightning talk! We'd love to see it! Find out more details and RSVP on our Meetup page. We'll cover the usual exciting happenings in geodata, upcoming geoevents and bring your own geo-show and tell. Jan 29 MaptimePDX // the Bike Edition! Matthew Hamtpon (Metro) will talk about the history of the Bike There! map and what's happening at Metro related to bikes and infrastructure. Momoko Saunder (Biketown) will present on some of the tools they use for visualizing data on maps and how they use them to improve operations. Rafa Gutierrez (Mapbox) will showcase recent cycling applications built with Mapbox tools. As usual, there will be time to hack on projects in the second half and share whatever challenges you're working on. Maptime is a time for learning and asking questions. We welcome newcomers and anyone wanting to teach or learn. Have an app or cool idea to share? Get in touch or just join us Tuesday Jan 29, 6-7:30p at CNTRL East 329 NE Couch St, Portland. We'll have some pizza & snacks so be sure to RSVP. BYOB. The Esri GeoDev Meetup is back again, and this time it is organized around a theme of biking! That means the intro, keynote, and lightning talks will all be focused on usages of GIS development within the context of biking and cycling. Join us on Wednesday, April 3rd for this biking-themed meetup. Food and beverages will be provided. This event is a social gathering for developers to discuss the latest in mapping, geo technology, geo services, web and mobile mapping apps, app design, map data or anything else related to solving real-world "geo/biking" problems. Have you done research around or built a cool biking app recently that you'd like to show off? Submit a lightning talk! We'd love to see it! • Meet fellow PDX techies. • Show us what you got by demoing your application or framework. • Make a name for yourself in presenting a cool new/interesting concept or idea. • Impress others by sharing your experiences. • Make BFFs for life by connecting with other developers! - Matthew Hampton of Portland Metro, "The History of Bike There! – Tyvek to Today"
- Christopher Moravec of Dymaptic, "AI Cycling Navigation: The Data and Beyond"
- There will be one giveaway of a DevSummit Registration for 2020.